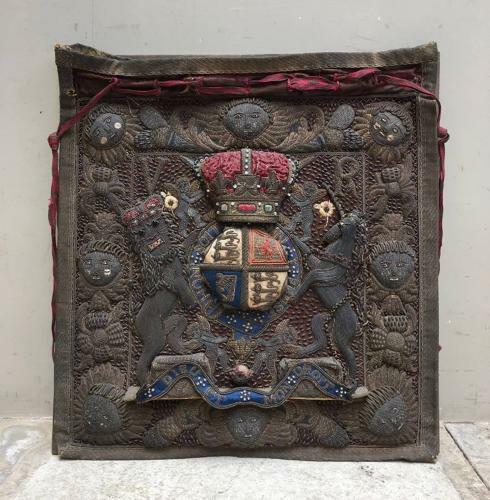 Rare & just wonderful condition Victorian Lord Chancellors Ceremonial Bag or Burse. This was used to carry the Great Seal of Great Britain. There would have been more than one made during Victoria`s reign and this is one of them. A burse was first used in the 17th Century and can be seen in portraits of nearly identical format through to the late 19th Century. This one has a V top left corner and R top right for Victoria. Stump work using metal thread and silk with beads and just such intricate work. I have had this for twelve years and is the best condition one I have seen. The asking price is what is paid then...but I am open to reasonable offers. I am swopping it for another item. I can post but would have to come Special Delivery Tracked and Signed for, Next Day before 11am for £28.